I used my first edition of Roving Coffee (in Stockholm, Sweden) to get feedback on my latest concept for stakeholders of organizational change. Some weeks ago I described the first version, which emerged from the discussions at the Stoos Gathering in Switzerland. Since then people have suggested a number of changes and additions. Broadly speaking, the suggestions came in two forms. My latest version lists no less than 25 groups of stakeholders, ranging from boards to unions, from customers to governments, and from coaches to families. All of these were suggested by readers and members of the Stoos network. We can regard these groups as people with different kinds of relationships to the organization. They are all impacted by organizational transformation, and therefore they have a stake in changes of management thinking. Other people suggested that I should distinguish stakeholders along the lines of those “who get it” and those “who don’t”. Some said I should separate “leaders” from “followers”. And some said we should not forget the change agents themselves. This made me realize that the innovation adoption curve might be a perfect model to address these concerns. It gives us another dimension for categorizing stakeholders, and it is a well accepted model for organizational change. It describes people with different mindsets and their interest in change. When I use both categorizations, the result is a stakeholder grid. Vertically, it lists stakeholders according to their relationships to the organization. Horizontally, it distinguishes people with different mindsets. I think this grid could be useful as a common language for change agents. For example, with my management 3.0 course I am (primarily) targeting middle management, employees, training firms, and coaches. And for each of these groups I’m now addressing the change agents, innovators and early adopters. During the roving coffee in Stockholm we discussed how nice it would be to have imaginative descriptions of personas for each of the stakeholders in the list, with names and pictures. However, I fear that this would lead to the development of at least 125 personas. What do you think? Is it useful to have such a grid of stakeholders, distinguishing relationships to the organization from people’s mindsets for change? Could this approach be helpful to develop a common language among change agents for organizational transformation? Do you have suggestions for condensing or expanding the idea? Hi Jurgen, great approach. Your blog inspired me to hint you to yet another viewpoint on organizational change. I propose to take a look at the panarchy model which (I assume?) found it’s roots in ecology. It models neverending (lemniscate) change cycles might be applied to all kinds of abstraction levels, from micro to mesa. I found a very nice interactive graphic with in the center the panarchy model, and in each of the phases of organizational change, the role types that could fit to catalyze the change. To get some idea of what panarchy is about, first take a look here (http://fitforrandomness.files.wordpress.com/2010/12/panarchy-diagram.jpg) for a nice 3D viewpoint. Take a look here (http://www.sustainablescale.org/images/uploaded/panarchy%20revolt%20remember%20color.gif) for a viewpoint how panarchies can be loosely coupled on abstraction levels. Take a look here (http://en.wikipedia.org/wiki/Panarchy) or here (http://www.resalliance.org/index.php/panarchy) for a condensed explanation. And finally, take a look here (http://gavinkeech.com/mememachine/) for the interactive model that has assigned change agent archetypes for each major phase in the (organizational) change. 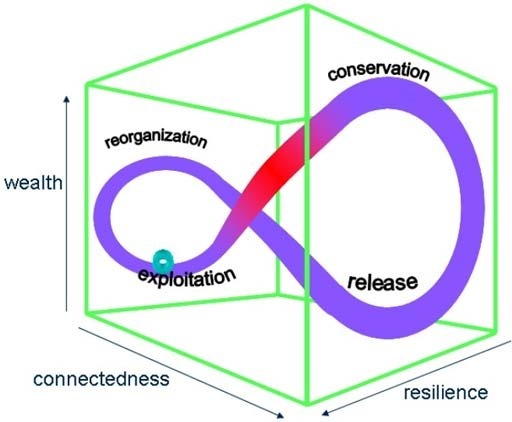 The way I envision how this could come to work, is that the panarchy could be used as a generic change model or framework if you like, and the change agent archetypes per change phase could be organized into a change process which is independent of the concerns and independent of the stakeholders. So in this way it would become more of a generic way of approaching organizational change. You could say that the change agents are the ‘strange attractors’ and because they are generalized, they are abstracted from the context (Stakeholder independent so to say). I am curious if this might be something to work out a little further. Hello Jurgen, you could also start to create 6 personas (one for each group in the adoption model), provided some stakeholders can be grouped. Each group having similar concerns, needs, behaviour, etc.. This requires you look into the most important similarities and differences between each of the stakeholders. You might up with a bit more than 6 personas, but that is still better (I guess) than 25.